Surprisingly, considering my utter worship of practically any mascara made my Lancôme, I don’t own a huge amount of their colour cosmetics. I have no idea why this is, but after their recent Pop Petrol collection, which I thought was really lovely (I ended up buying half of it for Other People, and have none of it for myself! ), it’s obviously something I’m going have to correct. I do, however, always spend time searching for the Chris Benz Pout-A-Porter lipstick releases when they’re out, but I was told recently that they’re only ever released in the US due to lack of interest in the UK! Very frustrating to hear that after you’ve dragged yourself around every department store within tube-distance, but them’s the breaks, I guess. It’s a real shame though, as I always think they look just that little more interesting than the regular releases we get over here. That said, it’s nice that Lancôme are doing UK-only releases (like Pop Petrol) these days, as we very often get short-changed a little bit by the bigger brands when it comes to Limited Editions. Where was I? 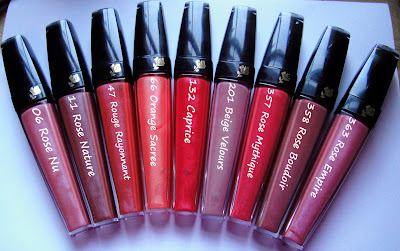 Oh yes, the latest Lancôme release is this set of L’Absolou Rouge Creme de Brilliance liquid lipsticks, which is a very lovely set of colours indeed. When I was at the Lancôme offices staging my recent Precious Cells sit-in, they also presented me with a set of these little beauties to get me out of the place. More liquid than a lipstick, but less gloopy (and they are not at all sticky) than a gloss, these are really super-comfortable to wear. I’ve found that they’re surprisingly long-lasting for a liquid formulation, taking about four hours before requiring a touch up – even after coffee and a croissant. They also fade very evenly, without leaving you with the tell-tale ring of doom. I’m not, in all honesty, a big fan of the heart-shaped applicator, being the cack-handed muppet that I am, but the lippies do apply very evenly without dragging, and they leave your lips feeling beautifully soft and moisturised after a day spent wearing them, almost as if you’d been wearing a balm rather than a coloured product. One further criticism: the numbers on the labels are too small! You will NEVER know the trouble I had trying to get them into numerical order for the product shot at the top of this post. 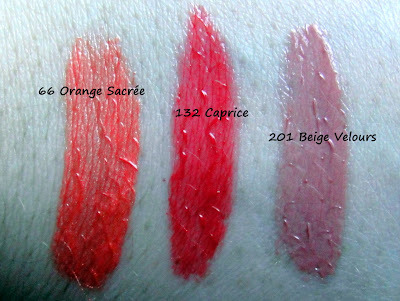 Now, would you like lip-swatches? Which colours stand out to you? 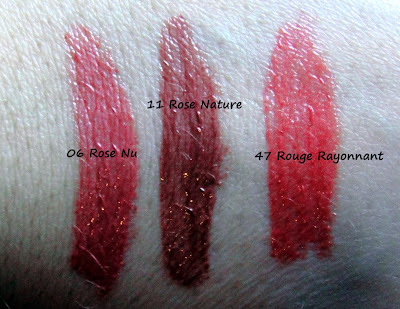 My favourite (surprisingly) is number 11 Rose Nature, which has an almost duo-chrome finish in the tube and is a lovely warm brown-rose shade on the lips. I’m not normally known for my love of brown, but it is absolutely gorgeous on the lips! The small print: I was given these as a bribe to leave the Lancome office and never darken their doorstep again. No PRs were harmed in the making of this post. As always, reviews are honest regardless of the source. I can't say how jealous I am that you have them all. I still kinda want Caprice but then I think I'm done. Orange Sacree and Rose Nu are great though and I'm getting a ton of wear out of them. I'd like to see a lip swatch of number 66, Orange Sacree por favor 🙂 I'm loving me a bright orange lip for the Spring and this looks right up my street. Also – so very very jealous! Caprice looks wonderful! 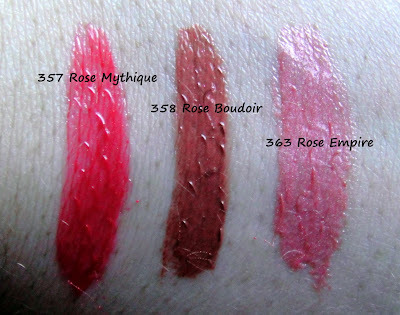 I'd love to see a lip swatch if possible.